← Where Should I Put Accent Colors In My Home? Want To See A Color Story? On this page, I will be featuring as many Color Stories colors as I can. Since this collection is fairly new and I’ve used so many of these colors in my clients homes, I wanted to share with you how they look and basically, what they’re all about. Come join me in a colorful journey of Color Stories and keep scrolling all the way down to see the entire collection of these colors. This picture is from Kelly Rodgers of Interiors for Families. She used Fair Isle Blue in her clients powder room to create balance and harmony in a room where otherwise, a busy granite floor tile was taking over. Thanks to this great hue, the tile is no longer the main feature of this powder room. The first thing you notice in this room is the amazing color. Where did the busy granite tile go? It’s still there, you just didn’t notice it yet 🙂 Thanks Kelly for sharing this photo with me. 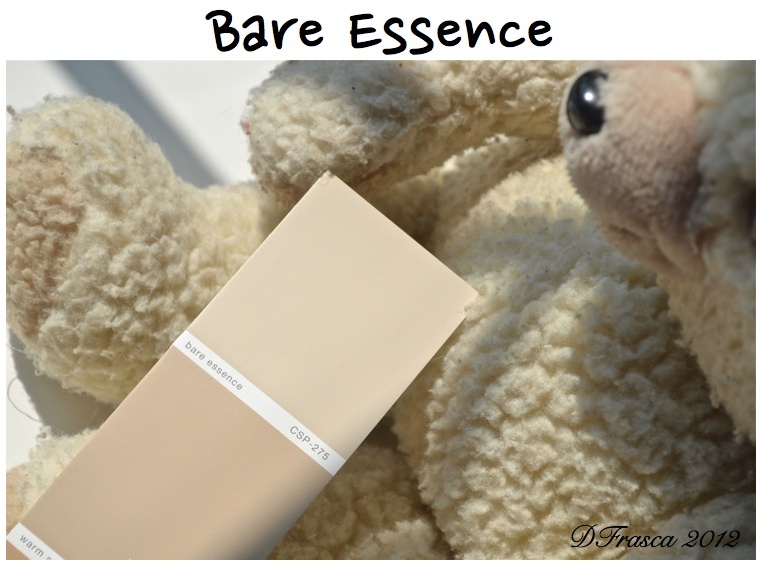 Bare Essence – another great neutral with a hint of pink that is “barely” detectable. 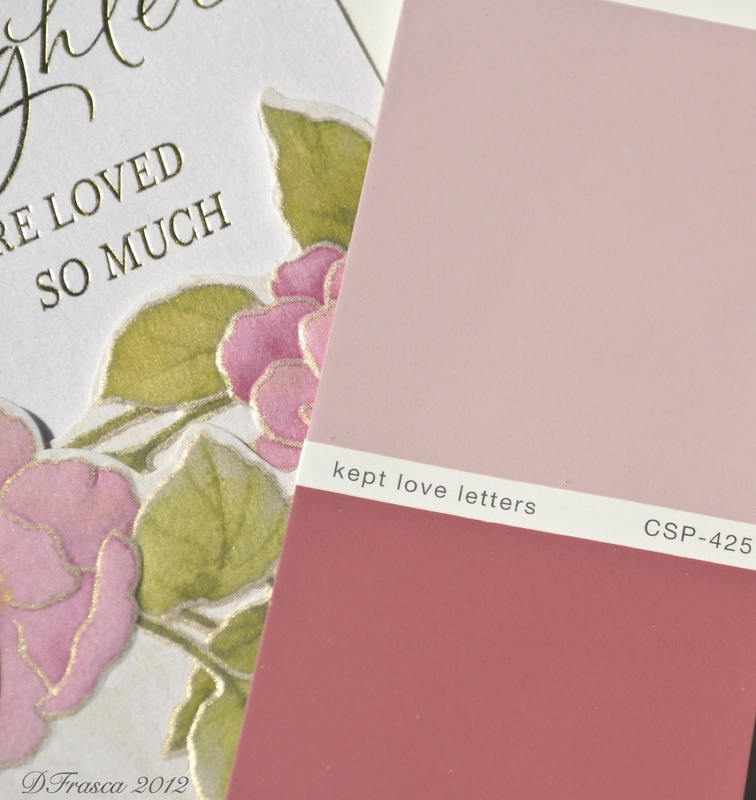 This color would be perfect paired up with a pink for baby girl’s nursery. There is so much you can do with these neutrals but look at the undertone and add an accent color that shares the same undertone. That will tie in the look. Awww, this is a color that Grandma would love because she has great style! Grandma’s China is another soft gray by Color Stories – so don’t just use this color for when company comes! Showcase it every day in your home. It’s hard to find a really good pink. Either they are too bubble gum, too pale, too peachy or just too much. Kept Love Letters is the perfect blend that you’ll, well – love! It’s difficult to capture the color or feeling of a pearl. 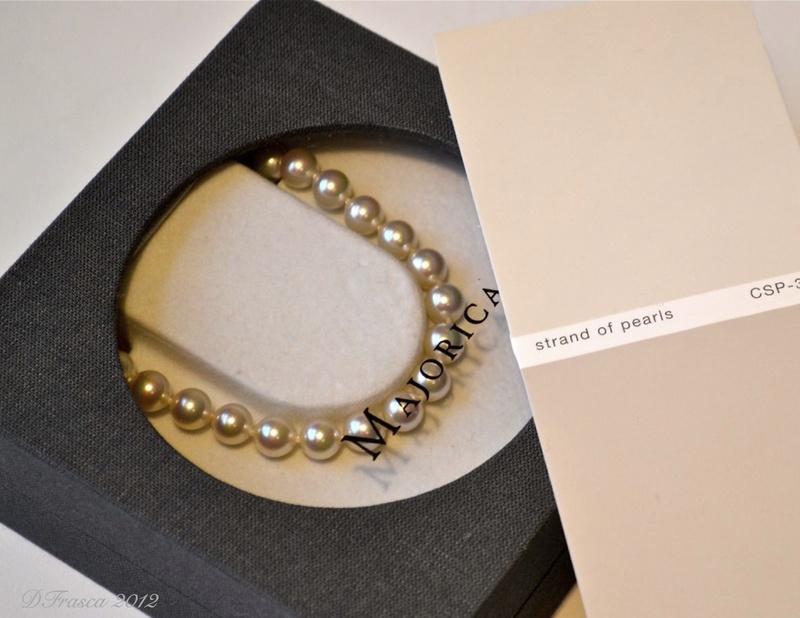 Like the perfect Majorica pearl, these two hues from Color Stories captures it well. 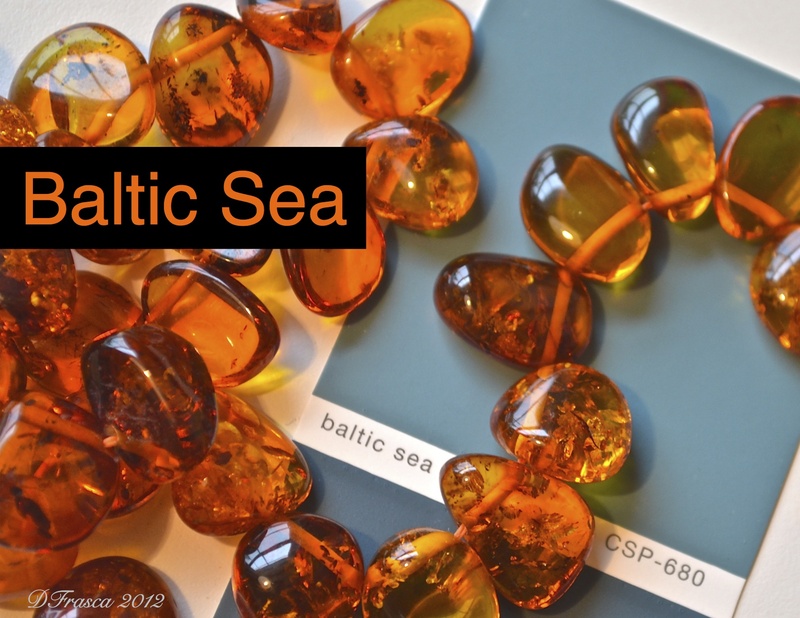 Now THIS is a color I can relate to – Baltic Sea. See that necklace? It’s Baltic amber and I have quite the collection since I’m from Lithuanian decent. This amber is collected from that region. Amber is fascinating so if you have a chance, read the link I have here on Baltic Amber – really cool stuff but be careful with it, it’s super soft! Oh and by the way Baltic Sea, this amazing blue, looks perfect parked next to amber. Is it green? Is it gold? 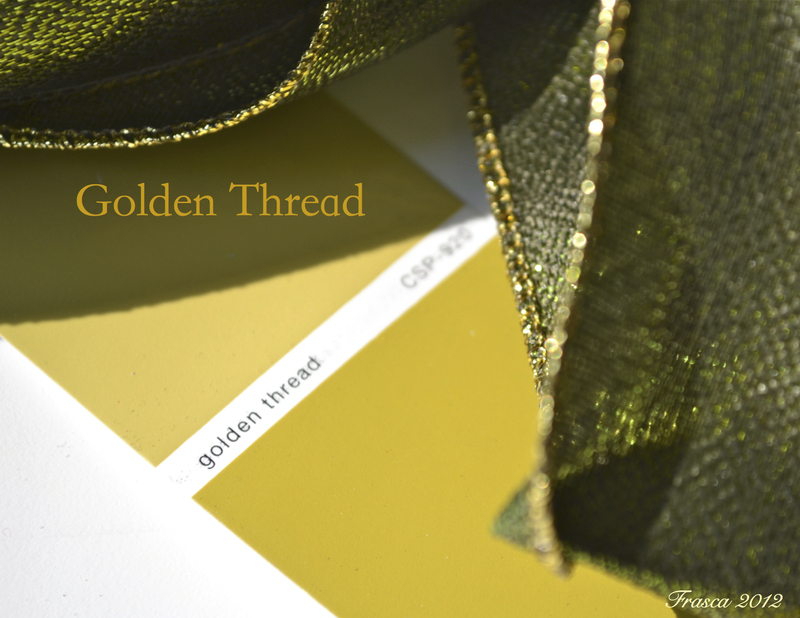 Golden Thread is both and it’s gorgeous! The lover of green will want this hue in their home but like a delicate woven thread, use it sparingly in your home. 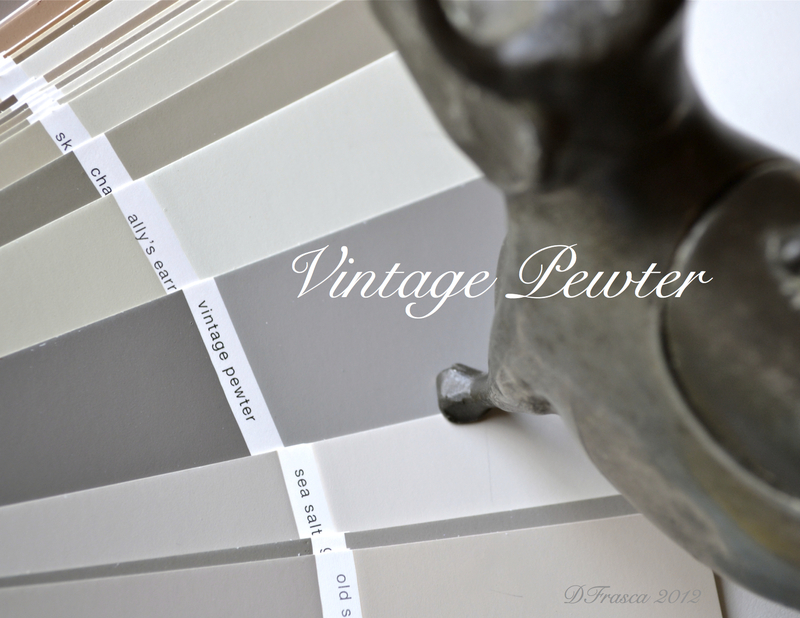 Like an antique, pewter figurine that Grandma used to have, Vintage Pewter is an old-fashioned, cool gray. Soft on the eyes yet strong enough to hold up to bold hues such as Navy, Burgundy, Black and Red. Try this one in your home with white trim and you can make this old color new again! Now I haven’t used Approaching Storm yet but just had to post about it. We’ve been getting some serious afternoon storms here in Charlotte, NC so I’m very family with this color rolling it. Actually, this may be the hue to use shortly since the rumor mill is leaning towards Navy this Fall. 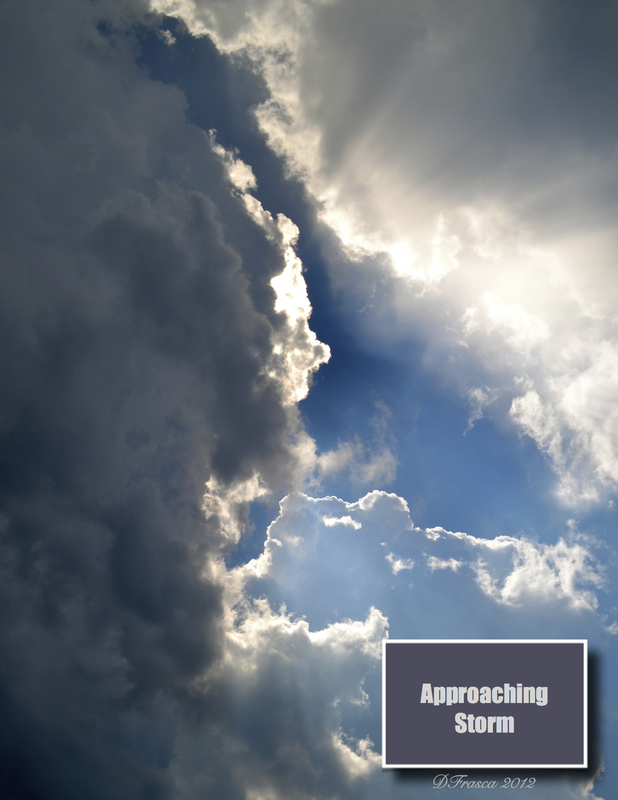 So, as Fall approaches, consider Approaching Storm for your home. 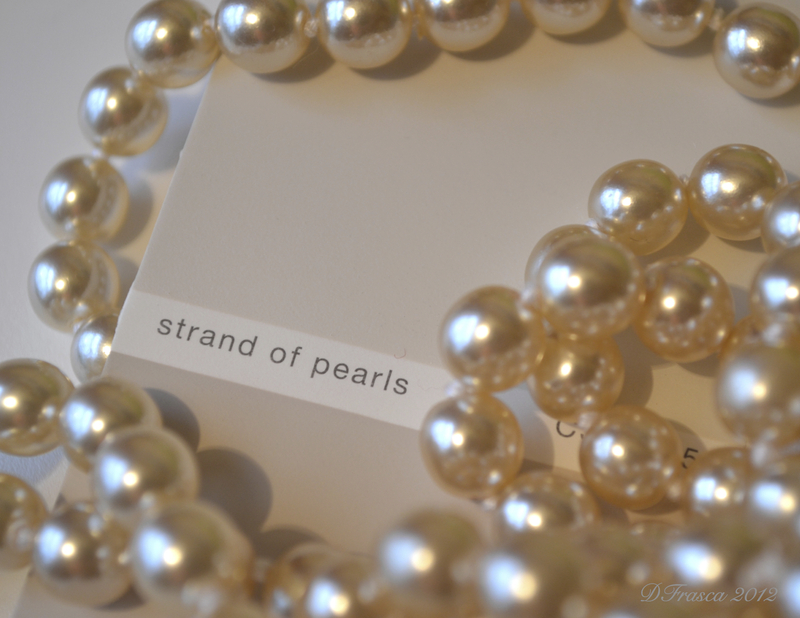 Strand of Pearls and Rocking Chair are super soft neutrals just like the colors you’d find in a pearl. Stand of Pearls photographed a bit pinker and actually looks very close to Rocking Chair which is also a soft neutral with a hint of pink like you’d find in a pearl. I’d pair these two colors together in a room for a tone on tone look. 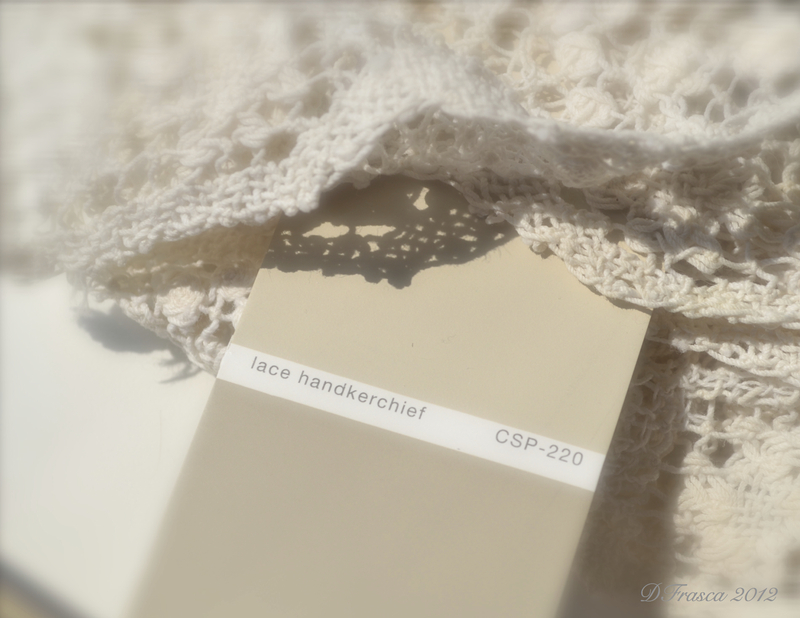 Lace Handkerchief – soft focus, almost gone, like a thing of the past. 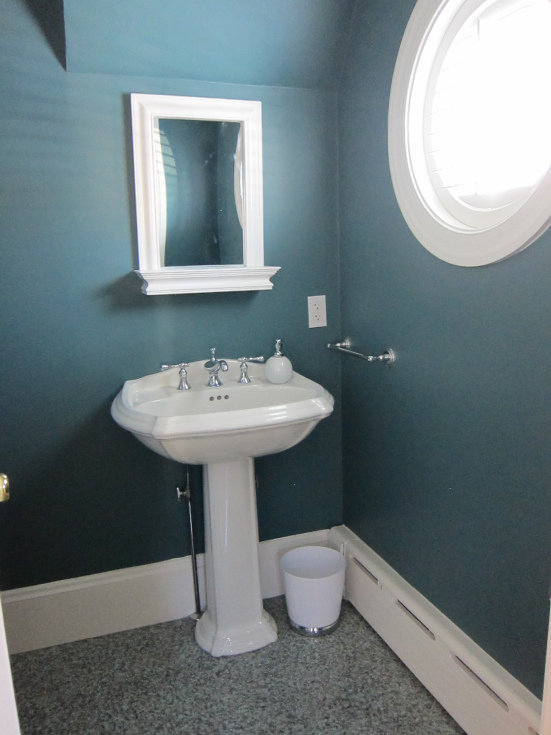 This entry was posted in Benjamin Moore and tagged benjamin moore, Color Stories. Bookmark the permalink. 10 Responses to Want To See A Color Story? Thanks for the post Donna! I have recently specified 740, Sylan Mist for a Northern dining room that turned out fantastic. It has more ‘color’ than paladian blue and is perfect for the room. I have also used 80 Gothic arch on another project. It is a sophisticated gray with a pink undertone. The Color Stories collection is so pretty but also a but on the expensive side which makes it a hard sell sometimes. However, you can’t beat these amazing colors! Great post, Donna! Have you noticed that the colors change significantly throughout the day? I heard this early on and have been a bit reticent to spec them for that reason. Very true! I’d heard that these were more prolific changers and I’ve shied away from them for the most part. Thanks for the beautiful pictures and inspiration. I LOVE the factoid you write on your invoices. Smart lady!! What trim paint would go with BM Grandmas China? Since Grandmas China is a fairly light color, your best best would be to go with a white like White Dove. This way you’ll have some contrast. Thanks so very much for your post. I have been searching via the internet for the Color Stories Palette, for reviews. I LOVE Aura matte paint for walls. I used it in my last home, and thought “I’m spoiled now, will never want to use another paint EVER!” Yes, it costs more, but looks so awesome! 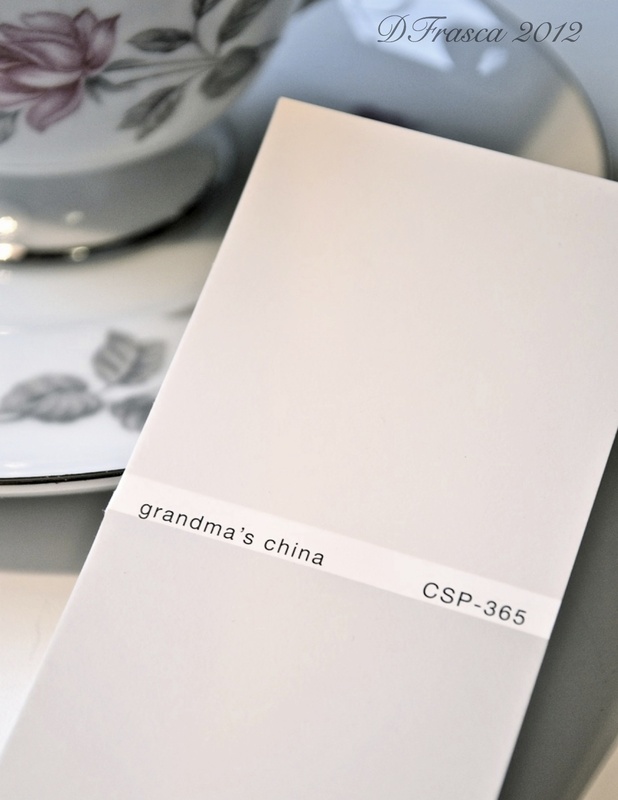 I think I will pick up a sample of CSP China White, to try out in my new living room. I have a grey (grey with red undertone, specifically Hancock & Moore “Piazza Greige” gray) leather couch that is just driving me up the wall, trying to find a color that will not turn the couch greenish gray, reddish grey, or just plain ugly. I wish I had picked a different leather. The style of the couch is so beautiful, but that Piazza Greige color of the leather….ugh. I LOVE the Color Stories but you’re right Theresa, it’s expensive but the colors are very “clear.” Gray is tough, a lot of people think it’s easy to use but like ALL colors, it has undertones -blue, green and pink. Gotta be careful!